A Cornish brewery is celebrating a big breakthrough on the national scene with its best-selling beer winning a 144-store national listing with Waitrose. It is the first time that Betty Stogs, consistently Skinners Brewery’s best-seller since the company’s launch 12 years ago, will be available in stores nationwide for a major multi-national superstore chain. It is the latest success in a new nationwide sales drive launched at the start of the year, with the aim of increasing national sales from 25 to 35 per cent of turnover. From mid-September, if sales go to plan, Skinners will be supplying Waitrose with over 12,000 cases – more than 140,000 bottles – of Betty Stogs for sale right across the nation over the next 12 months. The listing is the successful outcome to eight months’ wooing of Waitrose by Skinners, whose sales manager Stuart Hughes said: “We sent up samples to the Waitrose head office at Bracknell and their in-house tasting panel loved the beer. Neil Whelpton, Waitrose beer buyer, confirmed: “We are always looking for great local products that reflect the wonderful food and drink available regionally in this country. Before Waitrose, Skinners was already well on the road to national expansion through new supply contracts secured with Coors and Waverleys TBS, two of the UK’s biggest beer wholesalers. Within the last year, Skinners has also won national listings for various cask ales with major pub chains Wetherspoons, Punch Taverns and Enterprise Inns. Coors is doing a special Skinners promotion for its Cornish Knocker product and has hailed it as one of the company’s most successful guest ales ever. 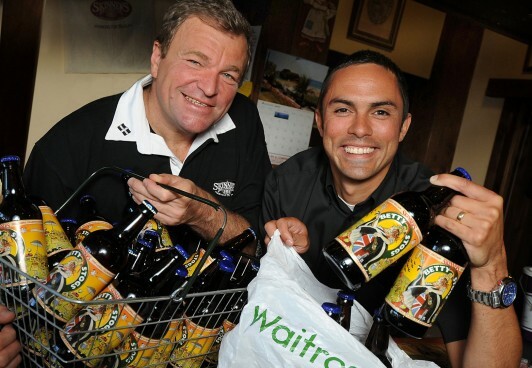 Skinners chief executive Steve Skinner said the Waitrose contract was “a great coup” for a young Cornish brewery still making its mark on the national scene and augured well for further similar contracts. “Betty Stogs has already proved its outstanding potential by being the best-selling beer every year for us and by being judged Champion Best Bitter of Great Britain at last year’s Great British Beer Festival,” he said. Mr Skinner added: “In the wake of Betty’s Champion British Best Bitter success last year, we decided the time was right to look more closely at our sales outside the county and to fly the Cornish flag further afield. It arrived in Stevenage Waitrose today. Lovely!